When I picked up the book Curriculum 21 a couple of years ago it was very refreshing to hear what I considered at that time a voice of reason in education. I was particularly struck by Jacob’s metaphor of upgrading the system completely rather than tweaking it. I also found the website full of great resources. 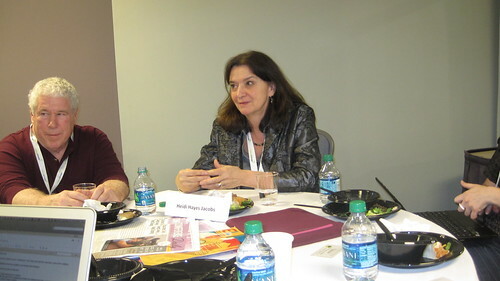 I was very excited to find out that Heidi would be at the press luncheon at the ASCD conference this past weekend. As I sat down at the table, I found that Heidi was sitting right next to me. She turned to me and asked my name and who I was representing. I told her about my blog and what I write about and a little about what I do. She asked the same of my colleagues sitting at the table. What ensued was a passionate, fast-moving and inspiring conversation about schools, innovation, connected educators and the future of the textbook. First, I have to say that Heidi blew me away with her friendly, relaxed and passionate personality. The conversation started with Heidi describing the three literacies that all students should have: digital, media and global. She talked about her work with Silvia Tolisano in creating globally connected classrooms. It was inspiring to hear her describe her Global Forum session in which the attendees were able to visit various countries to engage with learners. She is a strong believer that all educators should be globally connected. It was definitely preaching to the choir. I explained how nearly all of us at the table had known each other on Twitter before ever meeting online. As connected educators, we definitely have a leg up on our colleagues. Another reoccurring theme throughout the conversation was the new kind of teacher that is required for the new kind of learners that populate our classrooms. This led to a discussion about teachers as learners and differentiated professional development for teachers. This is obviously something that Heidi is passionate about. As she expressed the importance of self-selected PD, I was excited to hear that Heidi is familiar with the edcamp model. She emphasized that forcing everyone to receive the same information in the same way for a PD day is nonsense. One part of the conversation that really interested me was her new Livebook. As many of you may know, I was recently part of an inspiring Beyond the Textbook forum hosted by Discovery Education. I took part in a day of brainstorming and pontificating on what a textbook should look like, what it should contain and whether or not we even need textbooks anymore. From what I have seen (from screenshots and detailed descriptions), Heidi’s Livebook is still a book, but it’s like a book on steroids. It includes avenues for social reading, collaboration, note-taking and content that is easily updated by the author. I have not had a chance to request an advanced preview, but I definitely interested to see the interface. While I am still not 100% sure that a new kind of textbook is what educators really need, Heidi’s work on this project is an important piece in a larger puzzle. Hearing Heidi speak about the work that she does with teachers was equally inspiring. She described scheduling a Google Plus hangout or webinar with the leaders of the staff she would be working with. This shows her commitment to getting to know the communities with which she works before stepping in to help. She also talked passionately about differentiating professional development for teachers and distributing leadership so that school leadership is a collaborative effort. She also helps school leaders eliminate meetings and turn to virtual platforms for both asynchronous and synchronous collaboration to save time and use time efficiently. I was also struck by her statement that we should never be trying to sell anything in education. This reminded me of the term ‘buy-in’ that so many of my peers (and myself!) use on a regular basis. We need a shared vision, a compromise of sorts. Something that requires answering hard questions. I wonder how many schools are actually having those hard questions. I was glad to have had a chance to connect with Heidi, whose work I have admired since I first read Curriculum 21. It was an inspiring conversation and I look forward to following her Livebook project.